I originally wrote a long response as a comment on his blog but I thought it would be better to let the comment space be available to a lot more folks without being intimidated by a long comment and to offer my reply via blog. First of all, the “ethnicity” of being Mennonite within a congregation has a serious danger of creating cliques of those who are “in” and those who are “out”. I’ve seen it happen. People who are not ethnically Mennonite but have found something good within a Mennonite congregation end up, for the most part, on the outside looking in. They are accepted warmly, invited in, but those close ties and connections don’t happen easily because you cannot play the “Mennonite Game” of family connections and such and historical rootedness. Especially in congregations of a long history with very strong family roots, non-ethnic Mennonites have a hard time breaking through that wall. You end up with a divided congregation with two groups that are at odds when it comes to preserving historical traditions and breaking out in new ways. At worst, you end up with a congregation where those who are not “ethnic” slowly fade and peel off the outside. They never get the roots and so end up moving on to someplace where they can find that community they desire. This is the obvious “con” of the ethnic Mennonite church. However, there are some historically ethnic Mennonite congregations that some how have broken free of this trap. I’m not entirely sure how it happens, but they end up being able to enjoy and celebrate the stories of the past while still allowing God to bring in “new blood” and new people. Perhaps it is a matter of the general honesty of recognizing that there are important things to hold on to (radical discipleship, service to others, living a Jesus centered gospel, etc.) and things that are just temporary (family ties, worship styles, German/Russian/Swiss culture, etc). It is, I guess, a bit of wisdom that permeates where people are honest about their ethnicity and realize that it is just another culture like someone from Puerto Rico or someone from Korea. We have a Mennonite Culture that can blend with puertorriqueño culture and with Korean culture. What we need are stories from all the cultures. Chris asks about blending… we need people who can tell the Mennonite ethnic stories in ways that don’t come across as “this is the way things are and that is the end” but more on the lines of telling the stories as just threads in the larger tapestry. There needs to be a hospitality where people from other cultures can weave their own threads of their cultures into the tapestry of Anabaptism and Mennonite churches to be able to reveal how those streams of Christian theology inform and inspire people of other cultures. Swiss/German or Russian Mennonites are only one little piece of the larger picture. If we who are ethnic Mennonites (of which I am one) can set aside our cultural pride, can wash the feet of those who come from other cultures, can even sacrifice our own culture to allow someone else space, then I think we can see how those “new” people can add to our communal experience of Christ. This is the pro. That we bring into the tapestry a thread of history that becomes part of the larger whole but where we, because of the Anabaptist conviction of sacrificial service, give up our place of “status” to allow others to grow. How would you answer Chris’ questions? How can that ethnic culture benefit a congregation and how can it create problems? Along with Chris, I’d encourage you to read the original article that started this all by Tim Nafziger over at The Mennonite, Revisiting Anabaptist Camp Followers. Correct me if I read carelessly, but: I don’t see any pros listed in what you wrote. I only see 1) cons and 2) breaking free from those cons and recognizing that you’re only part of a whole. Which is fine. But also unsurprising. So – are there actually benefits that come with tribalism? As a non ethnic Mennonite, I’d say yes, sure. You? Actually, Philipp, what I was trying to imply is that the ethnica mennonite, by breaking free of the con, actually have a pro of adding a unique flavor to the whole. There is an advantage to that tribal history. It informs and enhances the experience. As others come into the Menno tribe from outside, some have expressed a sense of a lack of such rootedness. This is what an ethnic Menno can add… they can adopt such people in a welcome, hospitable way and accept them, whole-heartedly, into that history with no strings attached. This is a serious challenge, though, as it is VERY easy for such an ethnic Menno to exhibit a “superiority” because of their rootedness. But if done properly (and I’ve seen it done properly), it becomes a grafting on, much like the Gentiles were grafted into the church in Paul’s era. They gained the history of Judaism without having to be Jews and could feel like they were a central, core part of things. . . .and I think may be risking his or her faith (which I have seen far too many times, btw, many non-Mennonite people in this area of the world, heavily populated with Mennonites, they have tried soooooo hard to find a Church home among the Mennonites and ultimately come to associate that rejection with the Christian faith). So, I might ask: why are you tormenting us non-ethnic-Mennonites like this? You are most certainly allowed your cultural spaces, and we celebrate the freedom to do so with you, but please, be honest with us, your Church homes may not be homes for us. And also, if you are earnest about welcoming in non-ethnic Mennonites, share the power already, mmmmkay? We can see how you are holding on the power at those so-called “community” Churches. Almost all the leaders of Mennonite/anabaptist Churches are still white, ethnic Mennonites. You are not fooling anyone. We now know this is your turf, so don’t be so bold as to ask for my tithe, or my time–don’t ask me to warm the pew in the name of “diversity” so you can feel you are fulfilling Christ’s gospel and thus pat yourself on the back. And think about the spiritual consequences for the outsider–will they recover from the rejection from their taste of what is supposed to be Christian community? And incidentally, as Churches are human-rights’ free zones, if we have bumped up against this power and turf struggle over and over again, there is absolutely nothing we can do about it. You win! 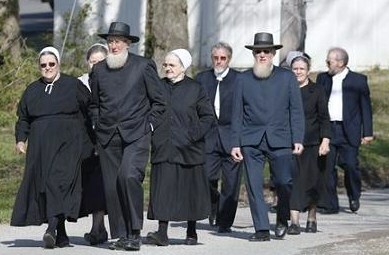 The peaceable, peace-loving Mennonites have won this war. . .they hold the power! This is some strange pacifism. So please: retreat. Cloister yourselves. Do not allow non-Mennonites in. Please. Been there, done that, twice. Doesn’t work. Worked much better in Church of the Brethren for me.